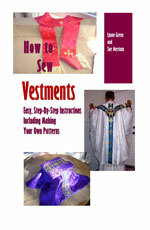 I am attempting to make a Roman chasuble. When centering the pattern on brocade fabric with somewhat large motifs, is the fabric folded in the middle of the motif so when the pattern lies flat, the motif falls in the center of the front and back? What is the best type of galloon to use? The fabric is gold and champagne color with metallic so do not think a "busy" galloon would be proper. Any advice is appreciated. You're right about folding the fabric in the middle of the motif. That's the best way to make sure the chasuble looks even. As for the trim, I would put plain gold galloons, and they should work out just fine.